Gabba Gallery represents fine art photographer Jeffrey Sklan at Photo LA, booth B-08. Sklan’s powerful new botanical show, Elegy, pays tribute to the victims of recent acts of terrorism and violence. 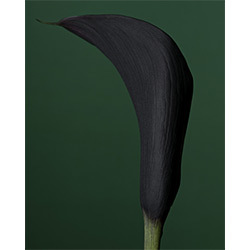 Each image captures the striking beauty of a different calla lily and is dedicated to the innocent people who lost their lives in an attack. Sklan began the series with A Lily for Orlando, a photograph honoring the 49 people murdered in the Pulse nightclub shooting, then added to the series as additional attacks took place across the globe. The exhibition is both beautiful and devastating as it memorializes the victims of these atrocious acts of violence that continue to occur with alarming frequency.